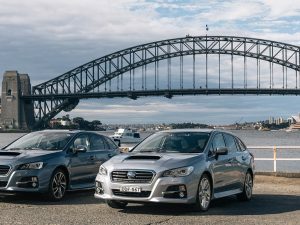 DriveMyCar, Australia’s largest peer-to-peer car rental platform, and Subaru Australia have inked a new partnership in an Australian sharing economy first, giving drivers the opportunity to experience the new Subaru All-Wheel Drive Levorg wagon. DriveMyCar, which is owned by the ASX listed company Collaborate Corporation, allows people and companies access to a wider range of vehicles not normally available from traditional car rental companies, at prices that are up to up 62% cheaper. Subaru, the first passenger car company in Australia to offer the program on DriveMyCar, will allow potential customers to rent ten turbocharged All-Wheel Drive Levorg wagons in a “try before you buy” scenario, for a period of seven to 365 days. Vehicles are available for rent on the DriveMyCar platform in Sydney and Brisbane. Using its proprietary PeerPass verification platform to ensure customer trust, DriveMyCar will manage identity verification, insurance, credit checks, payments and feedback. All rentals include insurance – including damage and theft, and roadside assistance. Today’s announcement comes off the back of rapid growth for DriveMyCar. The platform now boasts close to 30,000 registered users, has experienced growth in total vehicle listings of 117% in the 2015/16 financial year and 61% growth in rental numbers. DriveMyCar also recently announced a partnership with Uber Australia to provide uberX drivers who don’t own a car, quality vehicles at reasonable prices, with the added advantage of flexible rental periods starting from seven days. Since its Sydney launch in June 2016, the rideshare vehicle stock has been 100% utilised with enquiries exceeding supply three to one. “This initiative is in line with our Subaru ‘do’ customer promise, to explore different and innovate ways of meeting their needs. “It’s a great way to promote both the Subaru brand and initially the Levorg. “We are pleased to be working with Subaru to deliver a new way for our customers and UberX passengers to experience the new Levorg wagon.